UFC Fight Night Cowboy vs Edwards takes place in Singapore, Saturday June 23rd. “Cowboy” Cerrone, a former UFC title challenger who’s racked up 13 fight-night bonuses, was recently stuck in a three-fight skid before rebounding in his most recent bout with a first-round TKO victory over Yancy Medeiros. The former lightweight, who lost to notables Masvidal, Robbie Lawler and Darren Till during his recent skid, picked up his 25th stoppage in 33 career wins with the Medeiros victory. 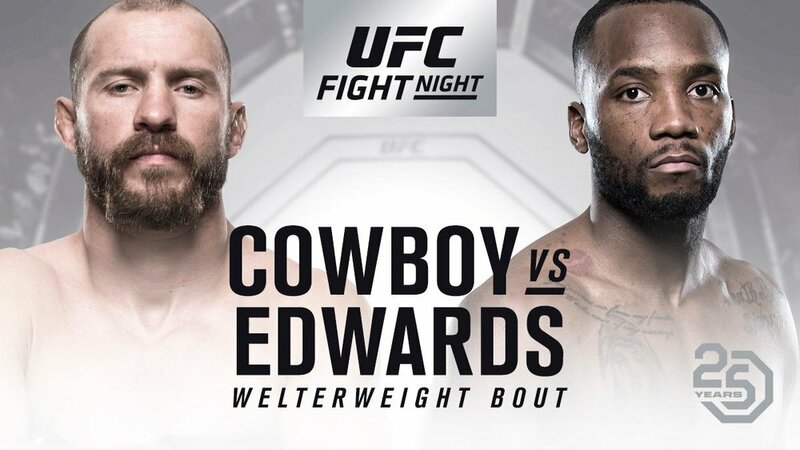 Edwards, a 26-year-old Jamaican-English fighter, is currently riding a five-fight UFC winning streak, which included a third-round TKO victory (with one second left in the fight) over Peter Sobotta in his most recent bout. The former BAMMA champion’s only UFC losses came to Claudio Silva (split decision) in his 2014 promotional debut and contender Kamaru Usman (unanimous decision) in 2015. He now faces his most notable opponent to date – in his first UFC headliner. The card is pack with Aussie fighters including Tyson Pedro, Jessica-Rose Clark, Jake Matthews, and Nadia Kassem.